January 17, 2018 (San Diego) - Gas and electric companies in California must lower utility bills so that ratepayers, not shareholders, will receive windfall savings from the federal tax reform bill recently signed into law. May 10, 2016 (San Diego) – The California Public Utilities Commission yesterday announced that it will reopen the record on the settlement agreement over the San Onofre nuclear power plant settlement that left ratepayers for SDG&E and Southern California Edison footing $3.3 billion of the shutdown costs. January 31, 2014 (Alpine)--The California Public Utilities Commission (CPUC) will hold a prehearing conference at 1:30 p.m. February 5 in the Oak Room of the Alpine Community Center, 1830 Alpine Blvd. in Alpine regarding proposed SDG&E’s Master Special Use Permit project that wouldl impact communities throughout the San Diego backcountry from Pauma Valley to Potrero (north to south) and from Ramona to Boulevard (west to east). The project is so large that SDG&E estimates construction will take about five years. Administrative Law Judge Jean Vieth will determine if there will be full evidentiary hearings for this project or if this prehearing conference will be the only time the issues are heard. 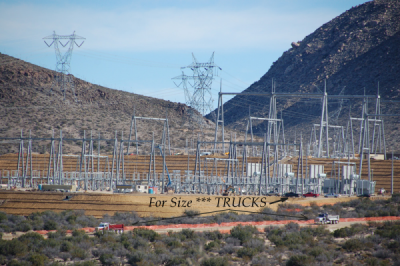 "In its application, SDG&E asked the CPUC for permission to construct this $418.5 million project without any hearings at all—their usual method of operation,"Backcountry Against Dumps, a nonprofit community organization, states in a press release.